Josh Hackler wanted to experience the real Spain--to live in a small town with a rich history and immerse himself in the language and culture. So, in 2005, he signed up for a study-abroad program through the University of South Carolina and headed to Oviedo, near Spain's northern coast. By day he studied the language and soaked in the Romanesque architecture; by night, he explored the town's wine bars and got to know the local Spanish juice. "I started talking to the waiters about their wines and the wine regions," says Hackler, now 24. "It turned into an obsession." It never occurred to him it could also turn into a business, until Christmas approached and his roommate sent a few bottles home as gifts. "You can buy an incredible bottle of Reserva in Spain for less than 3 euros," Hackler says. "So I figured, why not send a little bit more back and sell the rest?" James Rohrbach had his entrepreneurial epiphany while preparing to study abroad in France: "Figuring out where to go and how to make my trip happen was a lot harder than it should have been," says Rohrbach, 26. "So I set out to build a business that would help students pick a study-abroad program, plan their trip and meet other people who were also studying in the area." After graduating from Yale in 2005, Rohrbach took a job at a consulting firm, then quit to focus on building gullivergo.com. Today, the website profiles more than 1,600 study-abroad programs in more than 70 countries. The website, which is free for students to use, makes money from commissions paid by the study-abroad programs when a student picks one and signs up. "You should build a business around what you love and what you know," Rohrbach says. "But to build a differentiated business, you need to focus on some of the more unique experiences that you have had--and that's where studying abroad comes in." Hackler asked his father to visit a few grocery stores to see what kind of presence Spanish wines had. "It was very small, barely in existence," he reported. 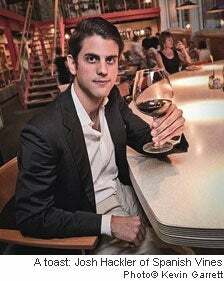 And so, in between studying and exploring, Hackler began mapping out his concept for Spanish Vines, a company that would import and distribute affordable wines from Spain. While Spanish wines were still making inroads in the U.S., the wine market itself was oversaturated with distributors. How to compete? What other distributors didn't have, Hackler decided, was what first brought him to Spain: an appetite for Spanish culture. "I knew it was going to be too difficult to develop a portfolio representing a bunch of different wineries from different regions because people were already doing this," he says. "So I decided to build a story around the culture of Spain." Then Hackler tasted his way throughout the country and found a winery producing two varieties he wanted to offer under his own label: a red Tempranillo and a white Macabeo blend. "Every year we do tastings of these vintages from various wineries with similar price points, and whatever wins the blind tasting, that's what we go with for the next year." In 2007, Hackler's labels hit the shelves of the supermarket Harris Teeter in Charlotte, S.C., both retailing for less than $15. The brand was the No. 1 selling Spanish wine during a two-month test, outselling the next-best wine 5 to 1. The Tempranillo went on to be recognized by Wine Enthusiast magazine as a "Best Buy" among Spanish wines. Today, Spanish Vines is in stores in Georgia, South Carolina, North Carolina, Virginia, Tennessee and Las Vegas, and there are plans for a nationwide rollout. Hackler attributes his success to his time in Spain. "You can't beat the experience of traveling to a different place and pushing your brain to a new limit," he says. "Then you tie it back to business by identifying a problem, a need or a way to reinvent something in your own way."